NAGA CITY (Bicol Standard)--The city government of Naga is determined to implement the towing ordinance this coming February, City Councilor Joselito SA Del Rosario, chairman of the Sangguniang Panlungsod’s committee on transportation told the Bicol Standard earlier today. Del Rosario said the ordinance should have been implemented earlier this year, but no towing company was able to qualify to perform the job. 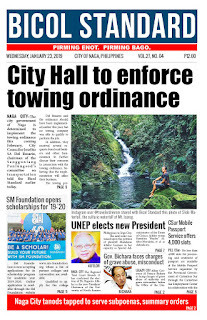 In addition, they received several requests from local bankers and other businessmen to further discuss their concerns in connection with the towing ordinance, believing that the implementation will affect their business. The towing personnel from the Public Safety Office in coordination with the Naga City Police Office will primarily focus on Central Business Districts (CBD) I and II. As of the moment, the city government is still looking for an impounding area, which should be located near CBD I and II. Violators will be imposed a penalty of P1,400, P400 of which will go to the city coffers, while P1,000 will go to the towing company, he said. 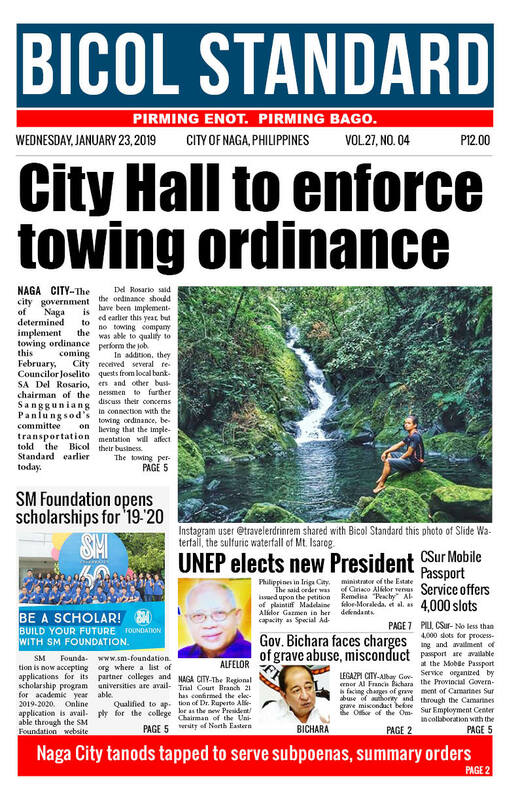 Del Rosario clarified that while the city is still scouting for a towing company, the City Hall will already start implementing the ordinance, temporarily using their own equipment to tow vehicles in no-parking areas. Meanwhile, the implementation of the wheel clamp ordinance remains in full swing.